When you look at Nicolas Cage, what do you see? Is it a talented actor who once used his trademark intensity to moving or riotous ends in films such as Leaving Las Vegas and Raising Arizona, who has become an expanding mass of tics so repetitive that his portrayal of a New Orleans cop (Bad Lieutenant) seems identical to his portrayal of a 14th century Teutonic Knight (Season of the Witch)? Or do you see an actor whose performances are a unique pleasure in cinema, who has forsaken traditional projects in order to star in bizarre genre films that are often terrible but occasionally brilliant and certainly never unmemorable, giving performances so large that they would look out of place in anything half-way decent or sane? Regardless, your response to Ghost Rider: Spirit of Vengeance is likely to be the same: dissatisfaction. For those in the first category, they will see yet another wasting of Cage’s talents – a poorly written, unimaginative superhero film where he descends ever further into self-parody. Those in the second category will finally appreciate the disappointment of the first group: if you’re someone who enjoys “Nicolas Cage” as a distinct cinematic persona then Spirit of Vengeance had lots of potential. Mostly this was because of the film’s directing team, Neveldine/Taylor, who direct as if they’ve snorted a bin liner full of sugar before every take and as a result have made some of the most interesting, awful, brilliant films of the past few years. The film’s premise is that a stunt motorcycle rider called Johnny Blaze sells his soul to the devil and becomes the eponymous superhero with a flaming skull for a head. Together with Neveldine/Taylor and late-period Cage this suggests all manner of headache-inducing goodness. Instead, Spirit of Vengeance ends up as something of a bore, despite the occasional good moment and the presence of Idris Elba, who walks around as if he’s in a better film. The characters are dull, the script is tepid and the plot reheated and largely free of incident, but the film’s problems go deeper than that. Fundamentally Ghost Rider doesn’t work as an idea. When Blaze becomes Ghost Rider he doesn’t pull on a mask, he’s possessed by an all-powerful, immortal spirit. This makes the Ghost Rider sequences almost impossible to feel invested in: it’s difficult to root for a superhero when he has become an entirely different person, one who is unstoppable and able to make his enemies combust within seconds of meeting them. It’s easy to feel sorry for Cage, whose penchant for buying remote islands and dinosaur skulls means he has to star in worse and worse films. Perhaps the biggest comic book fan in Hollywood, he’s ended up with a distinctly second-tier superhero. What might work in the pages of a comic book becomes curiously unmoving on the screen. 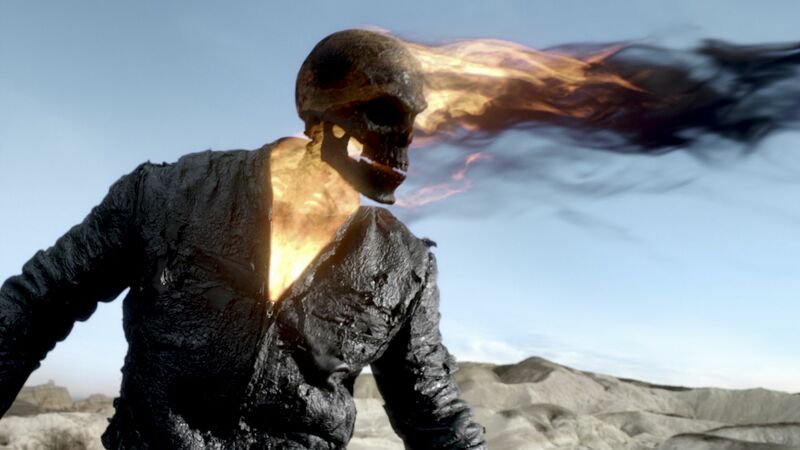 Even if it’s actually Nicolas Cage playing Ghost Rider, you’re still just watching some random spirit with a CGI skull going around exploding things for almost no reason. It’s a concept that’s only cool if you’re a 12-year-old boy, or Nicolas Cage.